It may seem like mixing oil and water, but as it turns out, installing Windows on your Mac isn’t a violation of natural law—your Retina display won’t melt or anything! In fact, doing so is actually a relatively pain-free process. To give the Windows 10 Technical Preview—a very early pre-release version of Windows 10—a whirl, you don’t even have to pay for a Windows license or already have Windows on your Mac. The Technical Preview is free to test. There are two ways to get the Windows 10 Preview on your Mac. 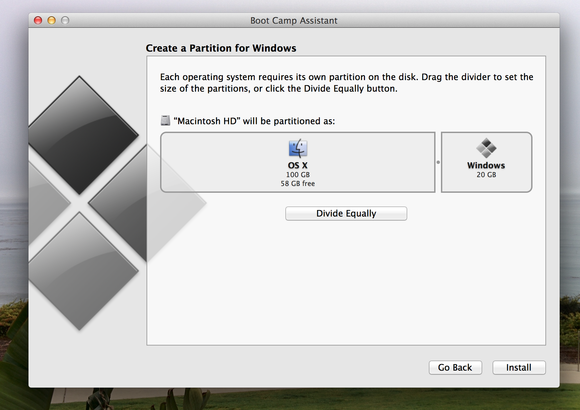 The first is to install Windows on a separate partition of your hard drive using Apple’s built-in Boot Camp software. When finished you can boot directly into Windows, essentially transforming your Mac into a full-blown Windows PC. Get Chrome or your other favorite apps on Windows 10. 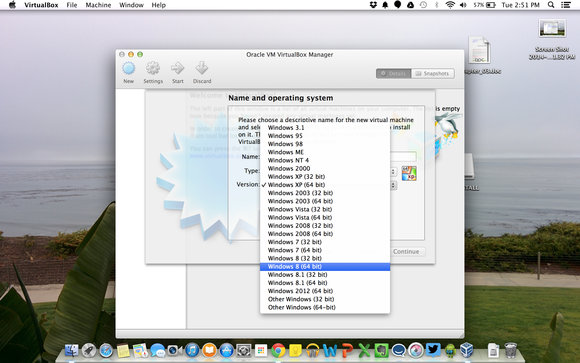 Another option lets you run Windows as a virtual machine inside an OS X program. We’ll be using the open-source VirtualBox from Oracle, though Parallels Desktop is a popular alternative (it costs about $80). A virtual is the route we recommend, given that the Windows 10 Technical Preview is still in very early form, with the occasional rough edge or bugginess popping up. If something goes wrong on a virtual machine, it won’t affect your hardware or OS X installation—you can just wipe it and start over. 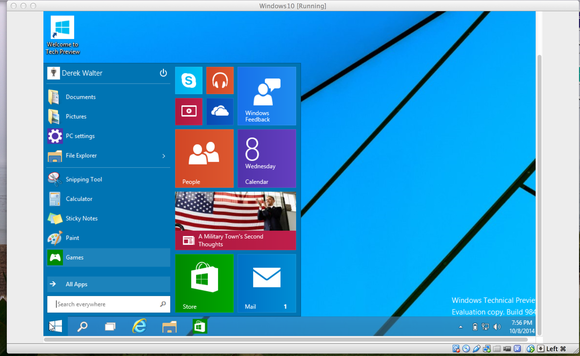 The Windows 10 Start menu is back, and you can have it on your Mac. As with any pre-release software, one person’s experience may vary with another’s. Mine was pretty issue-free: I installed Windows 10 on a late 2014 MacBook Pro with a 2.6GHz i5 processor and 8GB of RAM. Any Mac released in recent memory should be able to run Windows 10 just fine. Whatever you do, back up your Mac’s data first. Didn’t you hear the part about the Windows 10 Technical Preview being very early experimental software? You don’t want to lose all your valuable documents and family videos if Microsoft’s OS hiccups. Done backing up? Good. First we’ll head to the Windows 10 download site to download the Technical Preview. You’ll have to sign up for the Windows Insider Program by giving Microsoft your email address. After registering—note all the warnings about this being pre-release software, and Microsoft’s stern warnings about backing up your data—select the version of Windows 10 that’s right for your particular system. If you’re running a relatively recent Mac with an Intel processor, opt for the 64-bit version. It’s nearly 4GB, so get comfy—the download may take a while. Jot down the product key, too; we didn’t need it in our testing but it’s a good thing to keep in your back pocket just in case. Let’s explain how to get Windows 10 running in a virtual machine first, since that’s our recommended method. 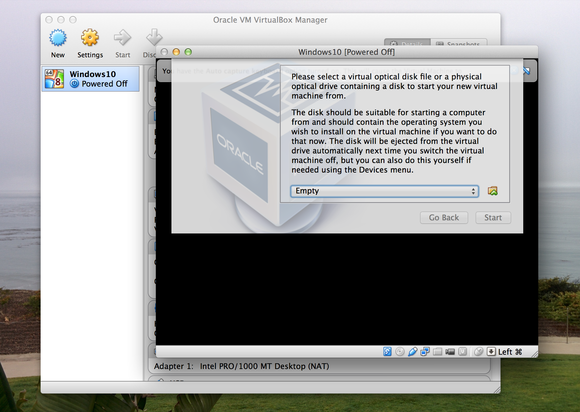 Head to the Oracle VM downloads page, and select the VirtualBox version built for for OS X hosts. Launch the download, dragging the icon into the Applications folder. Included is a 300-page PDF if you want a thorough set of instructions—though you can skip those and keep reading this if you don’t have time or desire to brush up on VirtualBox’s most arcane secrets. 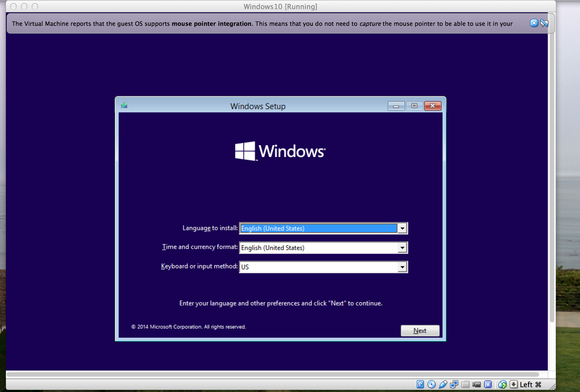 At the VirtualBox launch screen, you’ll be asked to choose which operating system to install. I chose “Windows 8.1” from the menu, as it’s the most recent version of Windows. Windows 8 should probably work out as well—just be sure to select the appropriate 64-bit or 32-bit option based on the version of Windows 10 you downloaded. Choose Windows 8.1 from the long list and get ready for some virtual computing. VirtualBox will then ask you how much RAM to allocate to running the virtual machine. You can go with the default of 2048MB if you’re concerned about system resources, but Windows 10’s performance will increase if you can dedicate more—you are running another operating system simultaneously, after all. If you can bump it up to 4GB without starving OS X’s own resources, that’d be perfect. Next you’ll be asked to create a virtual hard drive for Windows 10. Unless you’re planning on doing extensive work or installing more software, you can safely choose the default of 25GB. Select the VirtualBox Disk Image option on the next screen and continue. Locate the ISO file for VirtualBox and get ready to install Windows. The next choice is to select a dynamically allocated hard drive or fixed one. As you can probably figure out from the context, the former grows as you add space, and it’s a better choice if you’re short on space and don’t plan on adding that much to your Windows mock computer. The fixed drive, on the other hand, will give you faster performance as long as you can spare the room. When all that’s done, highlight the Windows 10 VM in the VirtualBox dashboard and select the green “Start” arrow. You’ll be prompted to point the VM towards the Windows 10 ISO file. After doing so, you’ll see the Windows logo with a black background. You’re on your way! The Windows signup screen will appear next. Pick a language and hit Install now. Then you’ll have two choices: a custom or upgrade installation. Select custom, then choose a specific location on the hard drive for installing Windows. Just leave this as it is—it’s installing to the virtual hard drive created by VirtualBox. This is the first screen you’ll see when installing Windows 10. Now it’s time to install Windows and plug in your Microsoft account credentials. If you don’t have an existing account, you’ll need to put in an email address to satisfy the Windows gatekeepers. This enables you to save and sync settings across multiple Windows devices. Voila! 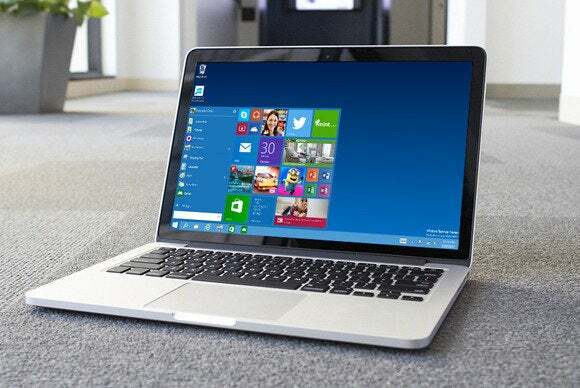 You’re running Windows 10 on your Mac. 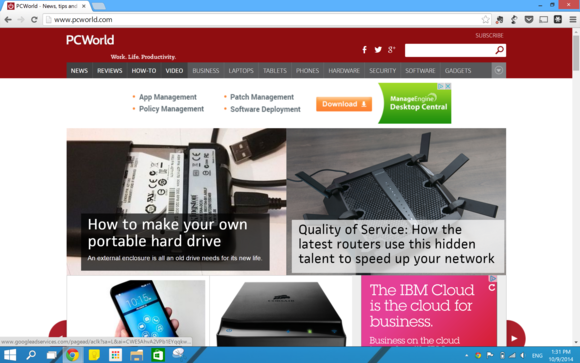 You’ll probably want to check out PCWorld’s guide to exploring Windows 10. Running a virtual machine is a slightly different experience than running an operating system on a hard drive. Things may move a little slower and appear janky. But it works fine for getting basic work done, or just plain playing around with Windows 10. When you’re done, just close the VM’s window as you would anything else. You’ll be prompted either to save the machine’s state as-is or power it off. For this you’ll need a USB drive with at least 4GB of free space. 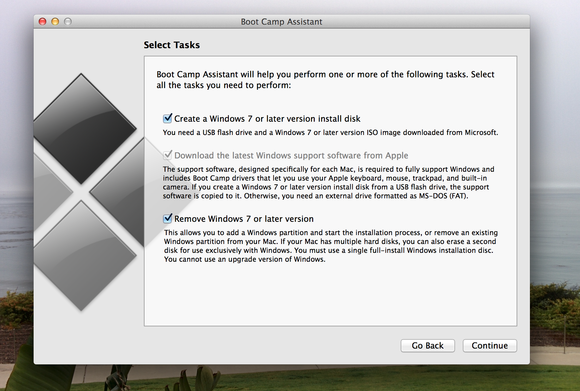 Boot Camp will take the Windows ISO file and create a boot disk that can be used to install Windows on your Mac. Boot Camp Assistant is your friend for installing Windows. Assuming you already have the Windows 10 ISO downloaded, launch Boot Camp. Tick all the boxes and proceed. Insert your flash drive and then select the ISO file’s location. Boot Camp will then download all the necessary drivers to run Windows and transform your USB drive into a boot disk. This step takes a while, so be patient. You’ll then be asked to partition your hard drive. This is a critical step, as you can’t expand or shrink the storage later on. Instead, you’ll have to wipe that part of the drive and start from scratch. Decide how much hard drive space to devote to Windows. It’s recommended you select at least 20GB, but 30GB or more is best, as Windows 10 itself will take up a sizable chunk. Consider how much you will be using it: Is it just for casually tinkering or do you want to install Office and do some serious work? If you want to play PC games, definitely bump up the free space you devote to Windows. When you’re done, click Install to start (you guessed it) installing Windows 10. Windows will next restart a couple of times. The longest wait will be when it hits the “We’re getting our apps ready” screen, which sat on my machine for 10 minutes. It does, however, cycle through some pretty colors for your viewing pleasure. If for some reason your computer boots back to OS X, reboot and hold the Option key. This brings up a menu where you can select which operating system to launch. 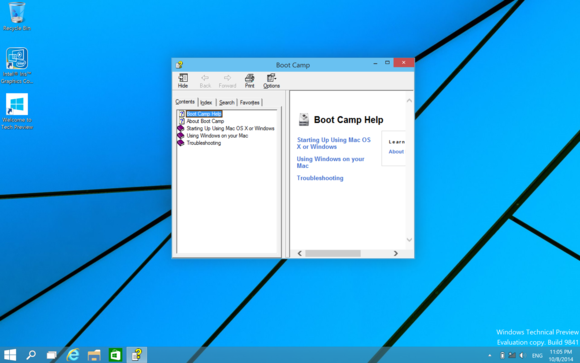 Use the Boot Camp Assistant help menu for troubleshooting issues. Overall, Windows 10’s performance on the Mac seems good. Scrolling with the trackpad works great with native Windows apps, such as File Explorer or Start menu, but it’s a little janky with browsers (I tried it with Chrome and Internet Explorer). I found myself reverting to clicking and holding the toolbar to scroll through a page. Windows doesn’t have as many trackpad gestures as OS X, either, so using a mouse may be a good idea. The brightness was a little inconsistent, fluctuating between too bright or too dark. The backlit keyboard was also confused: Trying to reduce its brightness didn’t work at all until the next-to-lowest setting, which then plunged the keyboard into near-darkness. Such inconsistencies are to be expected with a pre-release operating system, however. If you run into trouble or want to check system requirements further, both Microsoft and Apple offer support pages. And if you want to return to Apple’s warm embrace, just hold down the Option key during a reboot and select OS X as your chosen OS.